Washington Park Arboretum in Seattle contains a beautiful grove of 17 coast redwoods that are about 100 feet tall and 40 years old. When standing inside the grove of redwoods, it is like being inside Nature’s Cathedral. 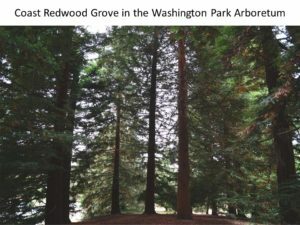 Below is a photo and video taken from inside the grove, as well as directions to it. It is a beautiful grove and well worth the visit. 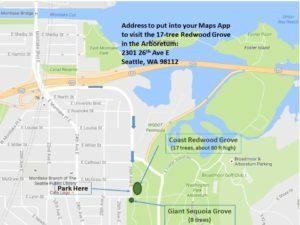 Click on the hotlink to see a 1 minute video taken from inside the 17-tree coast redwood grove at the Washington Park Arboretum near the corner of 26th Ave E. and E. Lynn St. in Seattle, 98112. Directions to the Washington Park Arboretum Coast Redwood Grove.